The Early Mesolithic period saw the continued re-population of Britain which had started in the Late Upper Palaeolithic at the end of the last Ice Age, around 10,000 BC. The distinction of the Mesolithic from the preceding period is founded on changes to the flint-working technology, rather than any significant change in the hunter-gatherer way of life. During the Earlier Mesolithic the climate was warming and the landscape was changing from frozen tundra to open forests of birch and pine and ultimately to a dense mixed deciduous woodland of oak, alder and lime. Rising temperatures and rising sea levels eventually resulted in the isolation of Britain from the rest of Europe, as low lying areas that were once dry land were inundated by melting glaciers. This process also led to the forming of the Wantsum Channel and the creation of the Isle of Thanet. The isolation of Britain, perhaps begun around 6500 BC and likely completed by around 5500 BC, lead to insular developments in flint technology, which had previously shared many characteristics with cultures recognised on the continent. The increasingly wooded environment also had an effect, prompting changes in lifestyle and flint-working which were responses to the development of new hunting and survival strategies. As with the Upper Palaeolithic, Mesolithic flint-working technology is characterised by the production of blades. This represents the most economical way to extract tools from the raw flint core, creating a minimum of waste. This economy was important to a highly mobile hunter-gatherer society who did not dig or mine for flint and might only occasionally encounter surface exposures of suitable raw material. Mesolithic tools could be small and light, often manufactured on blade-flakes knapped from good quality flint (where available). However heavy duty artefacts such as adzes, axes and picks were also created and employed. 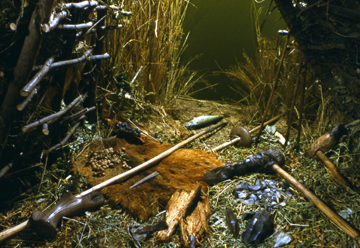 Mesolithic sites are encountered only rarely and the find spots of Mesolithic material from Thanet are few. Isolated finds of Mesolithic flint axes have been reported at Cliffsend and Nethercourt. Groups of flints that probably represent debris from temporary camps have been recovered from Quex Park, Westwood, Stone Bay, Thanet Reach Business Park and possibly Chilton. A site next to the QEQM Hospital might also fall into this category. An archaeological evaluation at Thanet Reach Business Park produced stake holes and a pit probably dating to the Mesolithic. This dating is likely but not certain, although the features should be no later than the Early Neolithic period, a time when our first farming ancestors were beginning to establish themselves. The period around 4000 BC saw the transition between the Late Mesolithic and the Neolithic and people who were living both ‘Mesolithic’ and ‘Neolithic’ lifestyles co-existed in the landscape for a time. It should not be imagined that our Mesolithic hunter-gatherer ancestors were physically replaced by a wave of incoming ‘Neolithic’ people, as probably happened in the Upper Palaeolithic when the Neanderthals were out-competed by our direct ancestors, the Modern Human Homo Sapiens Sapiens. It is more likely that many Mesolithic hunter-gatherers just began to adopt a new way of living that settlers were bringing across the Channel. There is evidence from elsewhere in Britain to suggest that by the end of the Mesolithic some hunter-gatherer groups were already living a more settled lifestyle and were beginning to experiment with stock raising. Including both identified and potential Mesolithic sites. A review of the only Thanet site known to have produced features which likely date to the Mesolithic.